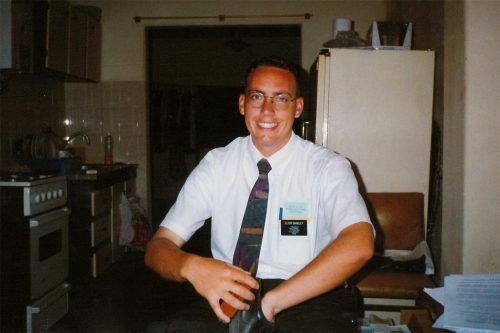 I served in the Saladillo Ward in Rosario Argentina from October 15 to November 11, 1997. I was surprised to get transferred to this area because it was only a month prior to the end of my mission. Being there for only four weeks, I didn’t take a lot of pictures and I don’t remember many members of the Church in the Saladillo Ward. We didn’t have any baptisms that month and there were not even any serious investigators that we were teaching. Still, it was a good month, I met and worked with a lot of great missionaries and I’m glad to had the experience. I have a brief story to share from my time in the Saladillo Ward and after that I will post the few pictures I have from when I was in this area. 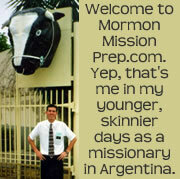 As a reminder, please visit this summary page about my mission to Argentina which includes the conversion stories of people I baptized and a summary report of each of the areas or wards in which I served. 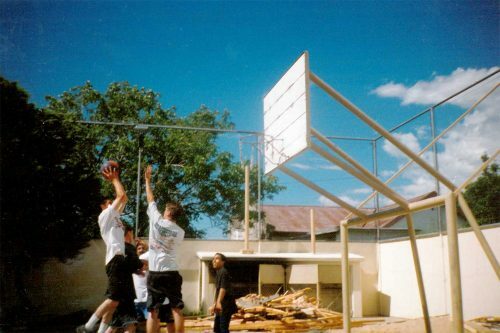 One memorable story I have from this time in my mission was when we did exchanges with some other missionaries in our zone. My companion, Elder Bandley, and I were the zone leaders and one of the companionships in our zone were really struggling. These two missionaries were not getting along and almost no missionary work was being done in their area. One of them went with Elder Bandley to work in our area for the day and I went with the other missionary to work with him in their area for the day. I got to the other missionary’s apartment in the morning, probably around 9am, which was the time, per the missionary schedule, when we were supposed to be leaving the apartment to teach or find people to teach. I asked the missionary if they had any scheduled appointments during the day, and he said no. I asked if they had any people to whom they were actively teaching the missionary discussions, and he said no. I asked him what they had been doing during a typical day over the past few weeks, and he said that they spent a lot of time hanging out at member’s homes. I told him that was not appropriate and that we would not be doing that. Just to clarify, visiting members can be a good thing for missionaries to do, provided it’s planned in advance and there is a spiritual purpose. That’s not what was happening in this case. I informed my missionary companion for the day that we were going to hit the streets and open our mouths, sharing the restored gospel of Jesus Christ with everyone we saw. I asked the missionary if there was a neighborhood or apartment complex that he suggested we go to for some door knocking and we headed out. Along the way, we stopped and talked to every able bodied adult we passed on the street. In those days, when we knocked doors or street contacted, we gave people what we called a “charla corta” which means short discussion. It was an abbreviated version of the first missionary lesson for investigators, and at the end of the charla corta, we would asked the person if we could come to their home to teach a more lengthy discussion. We spent the whole day talking to people of the street and knocking doors and we probably gave 100 charla cortas that day. That other missionary probably worked harder than he had during any other day on his mission. It was tiring, but it was great. At the end of the day, we had about 10 or 12 appointments to return and teach the full first discussion. The missionaries in this area had the calendar full for the next week, and we felt the Lord had really helped us find some good families to teach. I later found out that of those families that had invited the missionaries for a full lesson, most, but not all, followed through and allowed the discussion to happen. Of those, about half, 3 or 4 families, accepted the invitation to receive the second missionary lesson. One or two of them eventually came to church. And one of the people we contact that day, got baptized a few weeks later, and became of a member of The Church of Jesus Christ of Latter-day Saints. 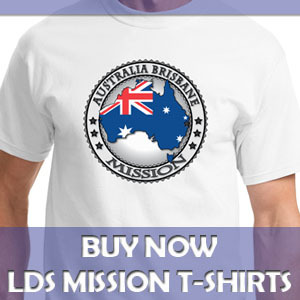 That’s why I say that missionary work is often a game of numbers. If you approach 100 people, only half or so will hear you out. Of those half who listen to your short discussion, maybe only one in 10 will invite you for a full lesson. Of those that hear to first discussion, only a percentage will progress to the second lesson, and only a percentage of those will come to church, and only a percentage of those will get baptized. While the percentage varies from country to country and city to city, the pattern remains the same in most parts of the world. If a missionary wants to bring people to Christ via baptism, which is the missionary’s purpose, knowing these numbers means also knowing that you have to always be opening your mouth and finding new people to teach and by so doing, you’ll be able to help more people move down the funnel toward baptism. Here’s my companion, Elder Bandley, shining his shoes in preparation for a hard day of missionary work, walking the streets, testifying to people of the truths of the gospel of Jesus Christ. Elder Bandley turned 21 while we were together. 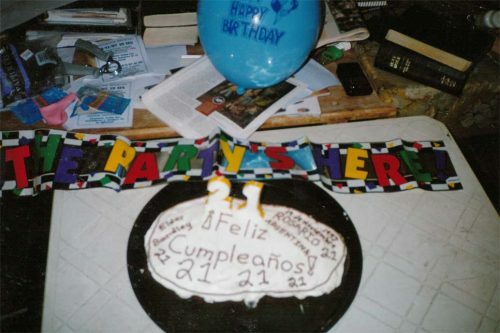 I attempted to make and decorate a cake for him but it didn’t turn out as well as previous cakes. I’m guessing his mom sent the celebratory candles, balloons, and other stuff. This is a picture our district basketball game on p-day. 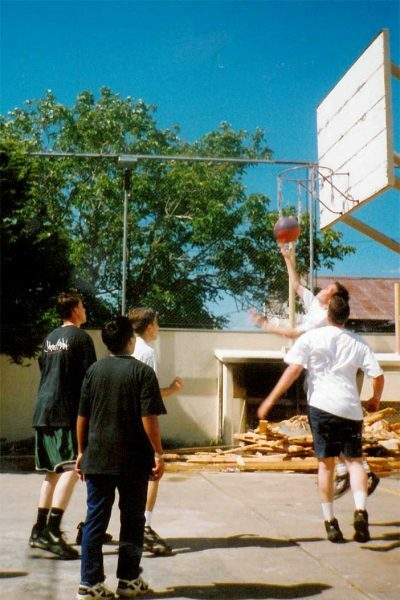 I’m the one with the basketball shooting a jump shot. In this picture, I’m the one with the ball shooting a reverse layup. 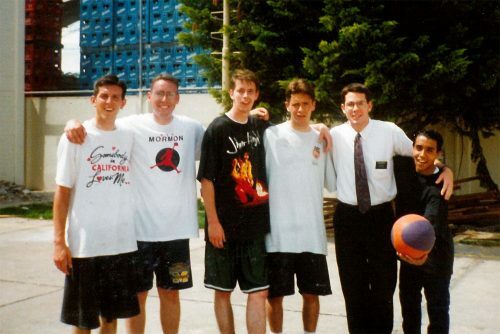 Here’s a picture of our whole district, from left to right: Elder Smith (that’s me), Elder Bandley, Elder Bates, Elder Facer, Elder Merritt, and Elder Benitez.